Linearity, Hysteresis, Accuracy and Repeatability of P/I converter. Working principle & calibration procedure of I/P converter. Working principle & calibration procedure of P/I converter. Linearity, Hysteresis, Accuracy and Repeatability of I/P converter. The I/P and P/I converter setup is designed for understanding basic principles of electronic and pneumatic signal conversion. 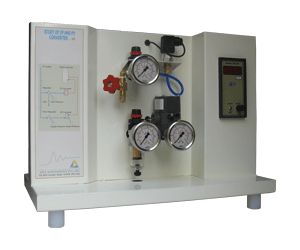 The setup consists of I/P converter, P/I converter, digital calibrator, pressure gauges and air regulator and air filter regulator. The Digital calibrator is used as current source to supply 4-20 mA DC to I/P converter and to measure the output current in mA DC from P/I converter. I/P converter gives the output as 3-15 psig and P/I converter gives output as 4-20 mA DC.